High Noon Holster’s Rock Steady line of belts are designed to carry the weight of a handgun at the same time they are built for comfort and action. The belts are individually handmade and are constructed from two pieces of top-quality, premium grade leather with a reinforcement in the middle of it. This reinforcement is sewn and laminated in between the two pieces of leather which gives the belt excellent rigidity and provides maximum support for any combination of weapons and accessories. A belt manufactured in this way is much stronger than just one or even two pieces of leather. The reinforcing layer also increases the life of the belt because it prevents it from stretching, rolling out, and sagging. High Noon Holsters was the first in the industry to reinforce gun belts with a synthetic insert. The belts are stitched around the perimeter just like a fine dress belt. The stitching adds dimensional stability and it’s really a classy look. All edges are rounded and then meticulously burnished. The belts are dyed by hand and sealed to a luster that illustrates High Noon Holsters® attention to detail. As a final touch, they are fitted with a solid cast, brass or chrome buckle. We also went to the extra expense of a fitted solid cast, brass or chrome keeper to match. Quick-change decorative post and screws are standard which makes changing the buckle easy if desired. Please review sizing instructions at the bottom of the page prior to selecting a size. Please Measure As Per The Instructions Below. 99% Of The Returns Are For Bigger Sizes! Simply measure an existing belt, with no gear on, from the hole you use to the other end of the belt and include the entire buckle. Take that number and add 2 inches. 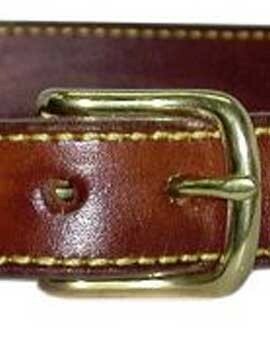 This number is the correct size that you need to order and will be the middle hole on your new belt. This will allow you approximately 2" of adjustment either way. You will have room to both tighten the belt, if needed, or to loosen it a notch. This will usually suffice for an inside the waistband holster or a belt holster. Remember when wearing a belt holster, the belt is going in and out of holster slots and an IWB is taking up extra room also. More belt is better then less. Sizes 48 and up will be $35.00 additional. Our on line order system will add it in for you.